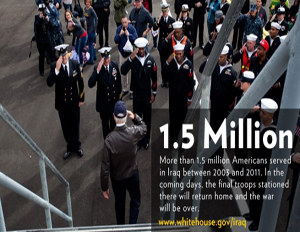 The costly and controversial war in Iraq officially ended on Thursday; nearly nine years after President George W. Bush launched an invasion to overthrow former Iraqi President Saddam Hussein. The U.S.-led mission in Iraq culminated in a tranquil ceremony where American troops lowered the flag of command that flew over Baghdad. Defense Secretary Leon Panetta, who flew into the Iraqi capital for the flag-lowering ceremony, reassured the troops the mission had been worth the cost in blood and dollars. “After a lot of blood spilled by Iraqis and Americans, the mission of an Iraq that could govern and secure itself has become real,â€ he said, according to CNN.com. The Iraq war has produced a hefty price tag. More than 4,500 American troops have died in Iraq since 2003, while the United States has spent over $800 billion in Iraq, in total. As of Tuesday, 5,500 American troops remained. A senior defense official traveling with Panetta said that some troops —possibly 3,000 to 4,000–will remain in Kuwait for a certain period of time but noted the details have not been worked out with the Kuwaitis.